Since I am a solid two months into Michaelmas (that’s a fancy word for “Fall”) term, I figure I should tell you all about the classes I am taking at Trinity. After all, “studying” is supposed to be a pretty substantial part of a study abroad experience, and my past few entries might have suggested that I am just off living the dream in some foreign land. I am, but I have to read things while I do it. Firstly, I cannot even begin to stress how different Trinity is from Puget Sound. The registration process alone was one of the most archaic and ridiculous processes I have ever gone through. Ever. Loggers, do not take for granted having timetables available to you nearly a year in advance, being able to register online, or relatively universal rules and standards among all departments! For the love of Thor, this university has been up and running since 1592. You would think that they would have ironed out the kinks of their registration system by now. Let me explain how it works, at least for visiting students in the English department. Regular Trinity students have relatively little choice in what they take; they are locked into their course from their first year on, and take what they are told to take. None of this ~liberal arts~ or core requirement mumbo-jumbo. Regardless, you have no idea when modules are offered here. None. Well, if you’re lucky enough to be in one of the Sophister (that’s a fancy word for “Upper Division”) courses, you’ll know what time slot it falls into, usually a two-hour block one day a week. But for the Freshman options, the ones that they want you to take so not to fill the precious places in the smaller, more advanced modules, you don’t get to know the time. You just get a name and description of it, and whether it is evaluated via paper or exam. Or both. The week before modules start is called Fresher’s Week, which is basically Trinity’s version of Orientation, only their icebreakers involve parties, alcohol, and other such merriment. (I was the cool kid who spent all of it researching and writing in the library, thanks to the final paper of the Semester Start-Up Program being due at the end of the week. Get off my lawn.) Then you find out the timetable. And make sure that the ones you want don’t conflict. And register for them. By writing them down. On paper. With a pen. Which you take to the person who controls all of the visiting students who then gives it to the head of the department to approve before you come back to pick it up and bring it to the international office where they keep that physical copy in a file somewhere in the abyss. TRINITY, YOU’RE DOING IT WRONG. Module = Class I may go to class, but I am taking a module. Next semester I will be taking a class entitled Narrative and Identity in Modern Scottish Writing, which is pretty self-explanatory. I’m just excited to finally read some Scottish literature since there is a worrying lack of it in my home library. David Tennant would be so ashamed of me. I’ll also be honing my Old English skills in a course about the Anglo-Saxon identity, which I am extremely excited about because the Anglo-Saxons are just the coolest people, next to the Romans. And the Vikings. Although school obviously keeps me very, very busy, I have found other ways to consume my time as well. Upon starting at Trinity I joined about six different societies (the term “club” is reserved solely for athletic groups) including but not limited to The Literary Society, The Classical Society, The Science Fiction Society, Trinity Gamers, the International Student Society, and Cumann Gaelach, the Irish language society whose emails I am unable to read. 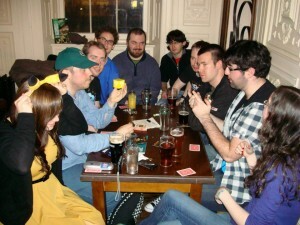 I regularly go to the meetups of a /r/IrelandGames board game group, which involves sitting in a pub or coffee shop once or twice a week and playing Settlers of Catan or Risk or whatever else strikes our fancy. (See below.) 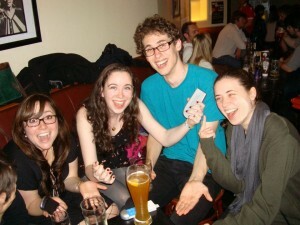 I also attend a “Dead (and Living) Poets Society” and compete in the LitSoc’s literary pub quizzes. Last time we won a bottle of wine for the most creative team name. What were we called? The Grapes of Rathmines. It’s funny because we live in Rathmines. Lol. If that wasn’t enough, this blog actually got me a job here, oddly enough; the right people saw it and I am now working as a copy writer for two Irish websites, Gruupy.com and RateMyArea.com. They are group coupon websites like Groupon or LivingSocial, and I am the one writing quirky deal descriptions for the different items they offer each day. 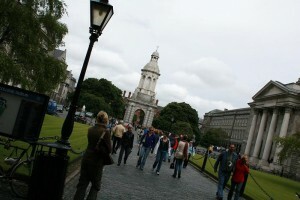 I also write reviews of establishments around Dublin (think Yelp) for the more literal side of RateMyArea as well, which is fun because it means I get paid to explore the nooks and crannies of the city and figure out who has the best espresso—The Bald Barista is winning so far, in case you are curious. Anyway, I must say that I’m rather thrilled to be putting my English degree to real world use! If anything, I’ve learned a lot about electronic gadgets and various beauty treatments, which I am sure will come in handy someday. What my life boils down to is that when I am not in class, I am in the office. And when you factor in meetings and societies and travel and socialising in addition to a 9:00-17:00 working day, it means that I’m just always busy and always tired. I guess this means I’m an adult or something, and I wouldn’t change it for all the cats on the Internet. I can’t envision my life being any more perfect than it is right now. 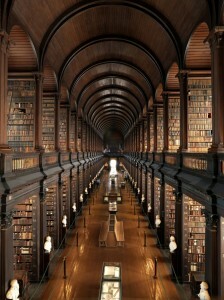 This entry was posted in Shelby Cauley '12, Dublin. Bookmark the permalink.